Editor’s note: As part of her Pig to Table Project, Haspel will update readers on her porcine charges’ progress each week. You can read her earlier posts here and here. 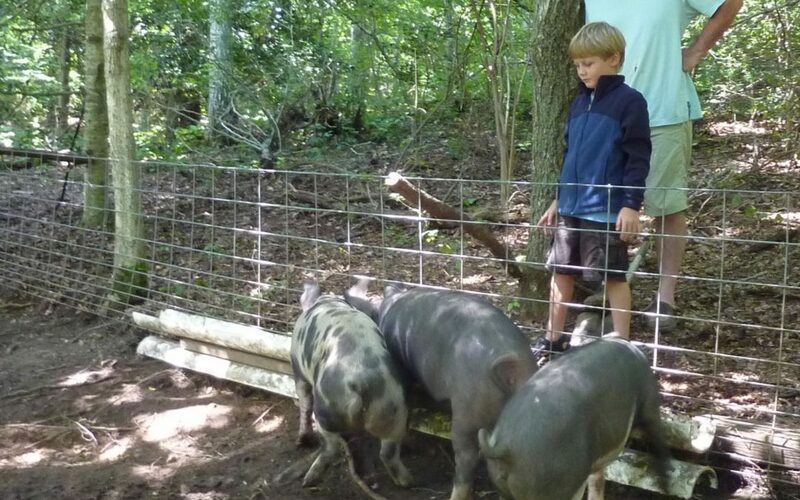 Because I’m raising pigs, I hear a lot of stories about other people raising pigs. It’s usually not the other people telling me the stories; it’s usually the children of the other people, whose parents raised pigs back in the day. The story almost inevitably involves the raiser of the pigs getting cast-off vegetables, stale baked goods, restaurant leftovers or dairy byproducts. The idea that you’d feed a pig swine feed, which you buy in 50-pound bags from the feed store, was alien. Now, it’s hard to get scraps, leftovers or byproducts. Mostly, that’s because there are laws about how substandard food must be disposed of — it can’t be given to humans. Grocery stores, retail outlets and restaurants are afraid that food intended for pigs might find its way to people. And make those people sick. Lawsuit to follow. The manager of a local Stop & Shop told me her hands were tied; all their inedibles go, by contract, to a composting company (although the company does rescue some of it for animal feed). I’ve approached Trader Joe’s, and I’m waiting to hear whether that store can help out. The manager needs the go-ahead from HQ, apparently. I can get a steady supply of spent grain from our local brewery, Cape Cod Beer, but the pigs don’t seem terribly fond of it. Luckily, there’s the Naked Oyster, a seafood restaurant in Hyannis owned and run by a woman with a soft spot for livestock. My husband, Kevin, and I have been friends with Florence Lowell almost since we arrived on these shores, but I was still a little hesitant, once we discovered that our pigs love fish skins, to ask her to collect scraps for the pigs. The Oyster is full to capacity this time of year, and asking the staff at a busy restaurant to set aside a container for fish scraps means asking for their time, their effort and their fridge space. It’s a non-trivial request, but I made it anyway. Florence agreed immediately. She liked the idea that what usually goes in the garbage was instead going to feed our three pigs. But she then had to make the non-trivial request of her employees. A couple days later, she reported back. Not only was her staff willing to make the effort, they were enthusiastic about it. The idea that we’d take their garbage and turn it into pork appealed to the culinary alchemist in all of them. I picked up the first lot this week. It was a plastic flat crammed full of skins and scraps, mostly tuna and salmon. It weighed more than15 pounds. That night, we grilled our dinner and used the residual heat to cook the fish. We’ll be using it over the course of a week, and we thought raw fish might get a little unappetizing, even for pigs, if we didn’t cook it. The pigs love it. When we come down to the pen with a tray of it, they climb all over each other to get the first bite. Although we’ll have to stop feeding it to them a month or so before their date with destiny to make sure the pork doesn’t taste fishy, the amount the Naked Oyster gives us will be a meaningful supplement to their diet between now and then. A pound of grain-based swine feed has about 1,800 calories. A pound of fish has about 600. That means that every 15-pound box of skins recycles garbage, makes for a high-quality protein supplement, gives our pigs some variety and saves us five pounds of feed. So, to Florence and the Naked Oyster staff, our pigs say thank you.